The arrival of affordable, high-performance client SSDs gave us two (closely related) things: 1) a high-speed primary storage option that could work in both a notebook or a desktop, and 2) independence from traditional hard drive form factors. 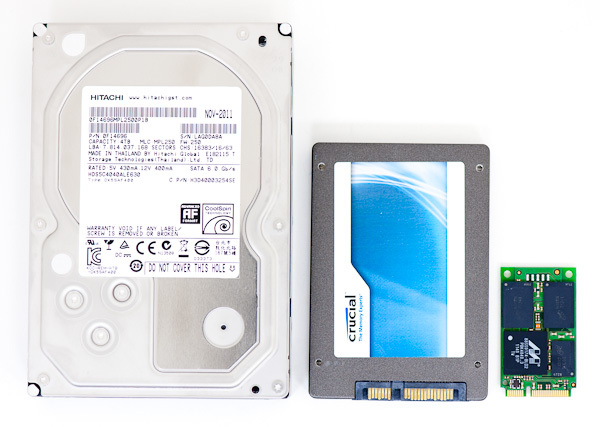 Unlike traditional hard drives, solid state storage didn't have the same correlation between performance and physical size. The 2.5" form factor was chosen initially because of the rising popularity of notebooks and the fact that desktops could use a 2.5" drive with the aid of a cheap adapter. Since then, many desktop cases now ship with 2.5" drive bays. It turns out that even the 2.5 wide, 9.5mm tall form factor was a bit overkill for many SSDs. We saw the first examples of this with the arrival of drives from Corsair and Kingston, where the majority of the 2.5" enclosure went unused. Intel and others also launched 1.8" versions of their SSDs with performance levels comparable to their 2.5" counterparts. 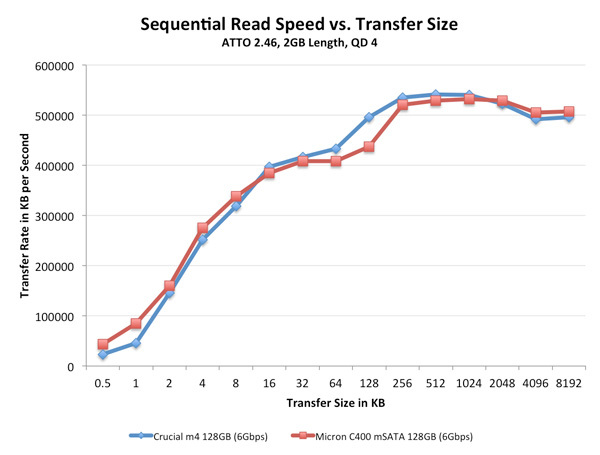 Moore's Law ensures that large SSDs can be delivered in small packages. Take the original Intel X25-M for example. The first 80GB and 160GB drives used a 50nm 4GB MLC NAND die (1 or 2 die per package), across twenty packages. Intel's SSD 320, on the other hand, uses 25nm NAND to deliver 300GB or 600GB of storage in the same package configuration. As with all things Moore's Law enables, you can scale in both directions - either increase capacity in a 2.5" form factor, or enable smaller form factors with the same capacity. 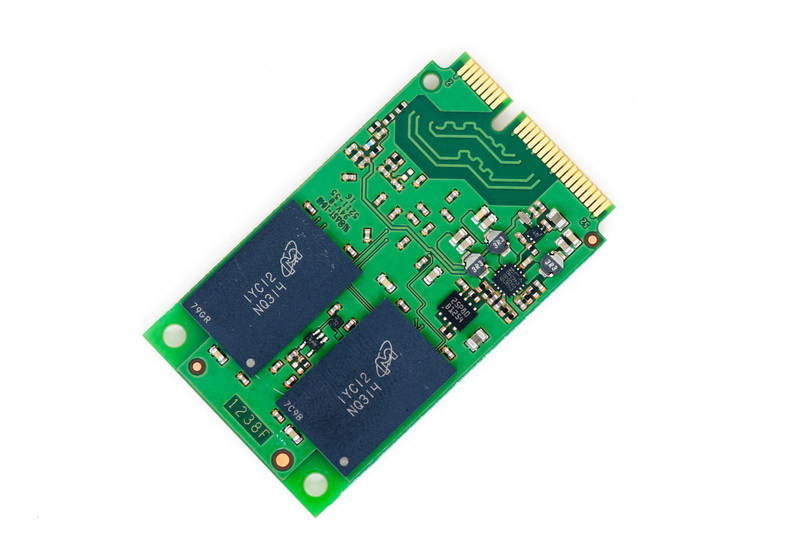 Take a mini PCIe card, use the same connector, but make it electrically compatible with SATA and you've got mSATA. It's even possible to build an mSATA/mini PCIe connector that can switch between the two interfaces. 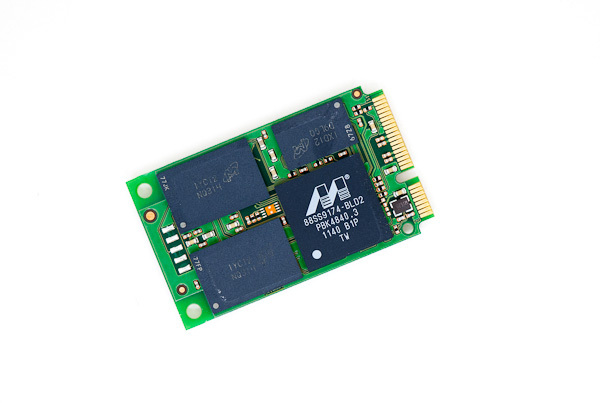 Given the extremely small surface area the mSATA/mini PCIe form factor allows, there's only enough room for the Marvell controller, 256MB of 1.5V DDR3 DRAM and four NAND packages. On a 128GB drive that works out to be 32GB per package, or four 8GB 25nm MLC die per package. You can scale up and down accordingly depending on capacity. Each package has two channels routed to it, thus behaving like a full eight channel drive but with only four chips. 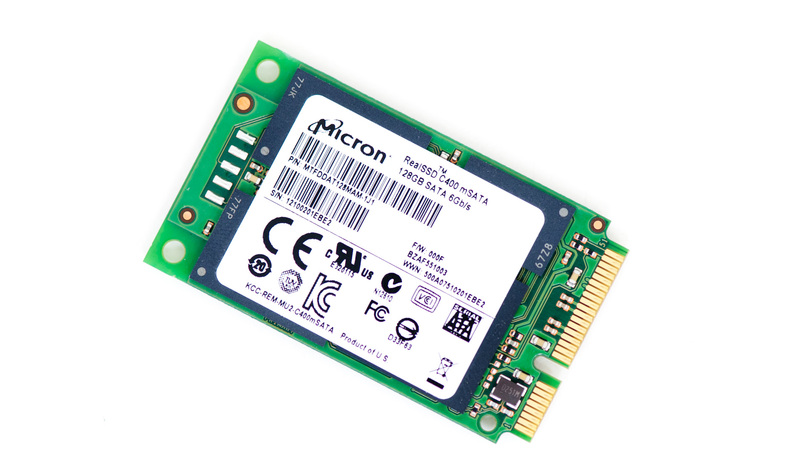 Micron will offer two distinct flavors: the C400v mSATA and C400 mSATA, similar to what we see in the 2.5" version. The major difference? Write endurance. The C400v is rated for 36TB of writes over the course of the drive compared to 72TB for the C400. The same type of NAND is used on both, this is merely a function of available spare area vs. the workload Micron is using to rate the drives. 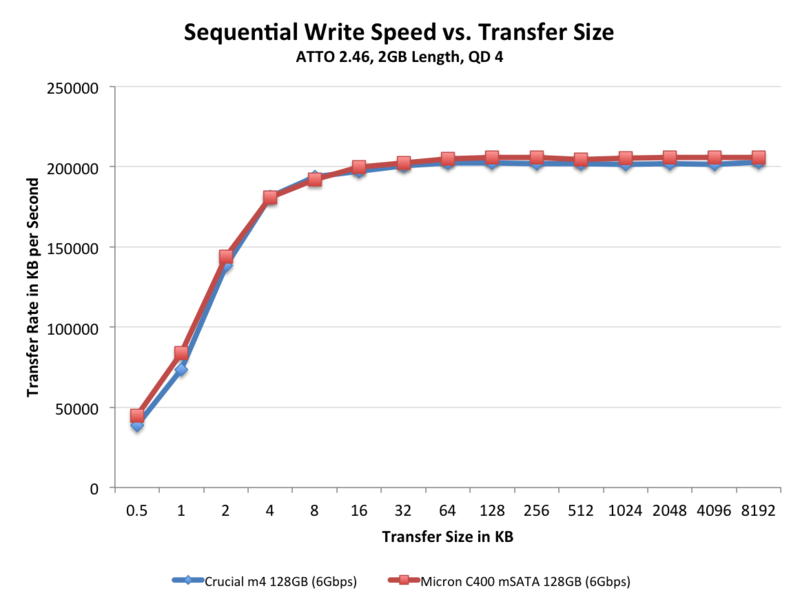 Note that Micron is using a client (read: largely sequential, PCMark-like) workload to determine endurance ratings here, not a 4KB random write test. Similar to the breakdown with the 2.5" drive, Micron will sell the C400 to OEMs while Crucial will offer a retail/etail version direct to consumers under the m4 brand. Micron isn't announcing pricing but you can expect it to be a little cheaper than the 2.5" version thanks to a slightly lower BOM (bill of materials). Micron sent a 128GB C400 mSATA drive along for review so we put it through its paces in our standard SSD test suite. 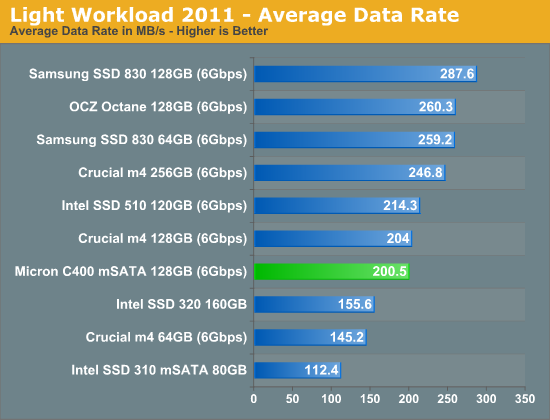 I've included comparison results to Intel's SSD 310 mSATA, but keep in mind this is a much faster, 6Gbps drive. Note that this is pretty incredible performance in an extremely small form factor. 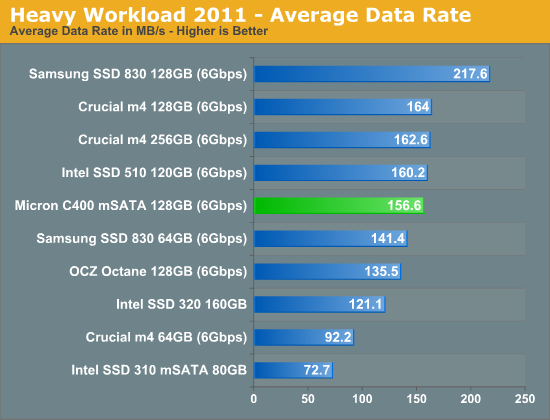 We're not too far away from being able to have a tablet capable of reading files at 500MB/s thanks to SSDs like this. I've included our usual benchmarks in the subsequent pages but you can also use Bench to compare drives directly. The C400/m4 have always been good drives, backed by a trustworthy name. Thanks to Micron's in-house firmware development team and extensive system testing courtesy of the memory side of the house, compatibility should be quite good. As promised, performance of the C400 mSATA is nearly identical to the 2.5" version, making it a formidable competitor in the mSATA space. It's also insane to think that you can pull 500MB/s from something this small - oh what SSDs have done to the world. I have no issues recommending this drive should you be in the market for an mSATA based SSD. Furthermore, I hope to see more small form factor variants of other major SSDs. While I don't know that this mini PCIe/mSATA form factor will be what replaces 2.5" for ultraportables, it's clear that 2.5" drives are going to be the new 3.5" as far as SSDs are concerned and smaller form factors will emerge to take the place of 2.5" drives. That's a neat way of doing it.